'Pozo Blue' is a superior, easy to grow sage that provides tall, showy spikes of violet-blue flowers that are a hummingbird magnet. The striking flowers and dark green leaves produce a showy, aromatic shrub that averages 4' by 4', compact enough to fit in many locations. 'Pozo Blue' is tolerant of heat and heavy clay soils and needs little water to thrive. With some pruning in the fall, the next spring will provide a show of blooms. This is one of the most adaptable of sages. 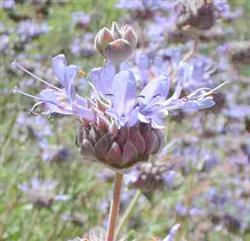 'Pozo Blue' is a hybrid of S. clevelandii and S. leucophylla that was introduced by Bert Wilson of Las Pilitas Nursery.